Two new episodes of my sketch show, with a range of new characters and the return of a few old ones too. This time, the Cowboy Interpreter ruins a political speech, the BSL Police intervenes in a bank robbery, a pub landlady struggles to get her Deaf customers to go home, and we reverse the usual situation at a Hearing Awareness Class! Actors: John Smith, Matt Kirby, Jean St Clair, Deepa Shastri, Nadeem Islam, Rebecca Withey, Adam Bassett, Donna Mullings, Ben Green, Gemma Arrowsmith, Erin Hutching and Jeff Bennett. Watch the Behind the Scenes film here. 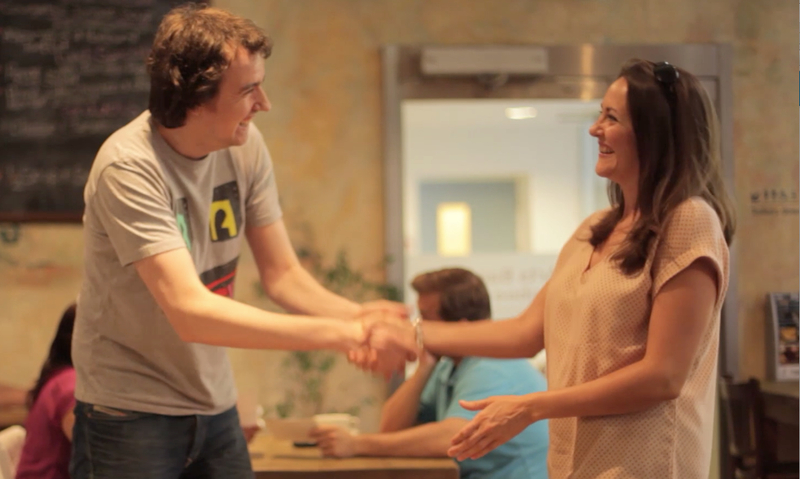 The world’s first sign language comedy sketch show for television. This programme stars 8 Deaf actors and comedians in the guise of a number of characters. The sketches and characters are drawn from Deaf life and popular culture, including a football manager, a fitness instructor, a Cowboy Interpreter, a Deaf spy, and many more. Actors: John Smith, Matt Kirby, Jean St Clair, Deepa Shastri, Nadeem Islam, Rebecca Withey, Adam Bassett, Fifi Garfield, Sue Mitchell and Ben Green. Festival screenings: Deaffest 2017, CineDeaf (Rome) 2017, Festival De Silencio (Milan) 2018. 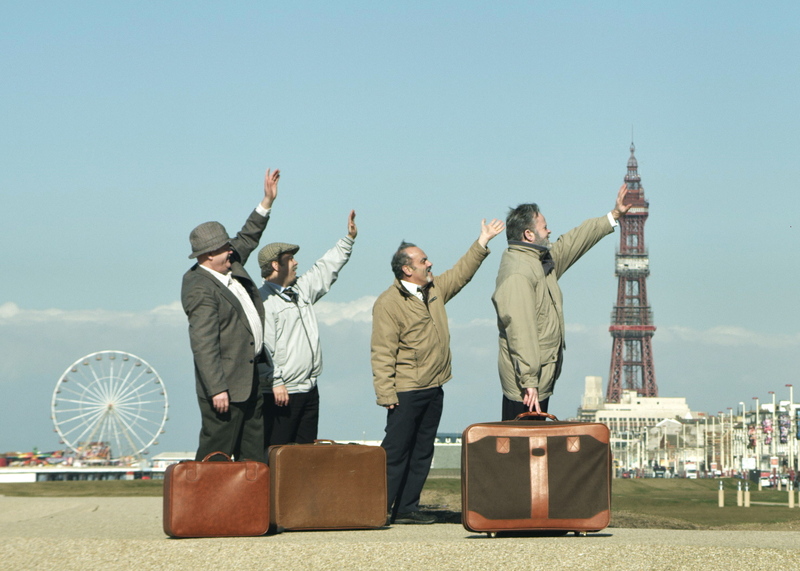 Four grumpy old Deaf men travel to Blackpool for an annual Deaf event. But when they meet a group of young Deaf men, things start to go wrong. Can the old and young men find a way to get on? Self-funded and produced, supported by Dada South. When a couple meeting in a cafe on their first date start talking to the couple on the next table, they find that some things can only be said with a kiss. Screenings: Bradford International Film Festival 2014, Shuffle Festival (London) 2014, Ilkley Literature Festival 2014, The Other Film Festival 2014, The Irish Deaf Film Festival 2014, MINCASOR Deaf Film Festival 2015 (Madrid), 30th Biennal of Theatre and Film for Deaf people 2015 (Barcelona), ReelAbilities: NY Disabilities Film Festival 2015 (New York), Ankara Accessible Film Festival 2015 (Turkey), Picture This Film Festival 2015 (Calgary, Canada), Bosifest 2015 (Serbia), Cinedeaf 2015 (Rome), Deaffest 2015 (UK, Nominated for Best British Film), BBC See Hear Sign Language Weekend 2015, Deaf Week (Germany) 2015, Hong Kong International Deaf Film Festival 2016, Dov Film Festival (Sweden) 2016, Bristol Encounters Film Festival 2016, Cork International Film Festival 2016, Glasgow Short Film Festival. Comedy mini-series about a family of 1940s deaf gangsters. With DeafFather growing older, can Sonny protect the family from the growing menace of the Opera family? Starring the great and the good of the deaf acting world, the series – directed by award winning deaf director William Mager – premiered in March 2010 on the Community Channel and on You Tube. A 30 minute version was released later that year. Filmed in one afternoon for £100, my directing debut clocked up over 130,000 views on YouTube. Four grumpy deaf men argue about their deaf childhood – and soon a waterlogged roof, a frozen little finger and a mould-ridden loaf of bread come to life in their hands! The film was followed by a sequelthe following year. BDA/Mutt and Jeff Pictures. Directed by Louis Neethling. A boy goes to his mother with a compelling secret. Will she understand? A quirky comedy, ‘Coming Out’ premiered at the London Deaf Film Festival and was later shown on BBC2, clocking up over 200,000 views on YouTube. The film won numerous awards around the world and an ITV Writers Award at the 2007 DaDa festival – the prize being three weeks with the Coronation Street story team.